As an artist defined by minimalism and abstract expressionism, Agnes Martin found serenity in her work. Commonly believed to have schizophrenia, Martin may have exercised her orderly grids and pastel colors as a way to find peace. After moving from Canada to New York City and earning her M.A. at Columbia University, she was supported by other talented artists such as Ellsworth Kelly and Robert Indiana. Martin began her career with exhibitions at Betty Parson's Gallery, and her work quickly traveled internationally from there. Eventually moving to New Mexico, the artist ended her career and cut off all social ties. Martin was represented by Pace Gallery from 1975 and was recently given a retrospective at Tate Modern in 2015. The complete set of 10 lithographs in colors, on firm transparency paper, with full margins, with text, the sheets loose (as issued), contained in the original gray card portfolio with printed uppers. 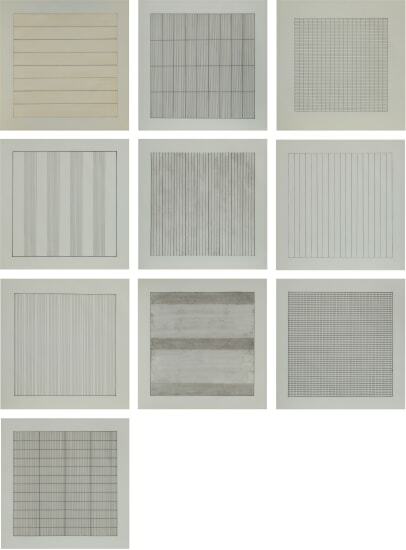 From the edition of 2,500 published by Nemela & Lenzen GmbH, Monchengladback and Stedelijk Museum, Amsterdam for Agnes Martin's 1991 retrospective at the Stedelijk Museum.